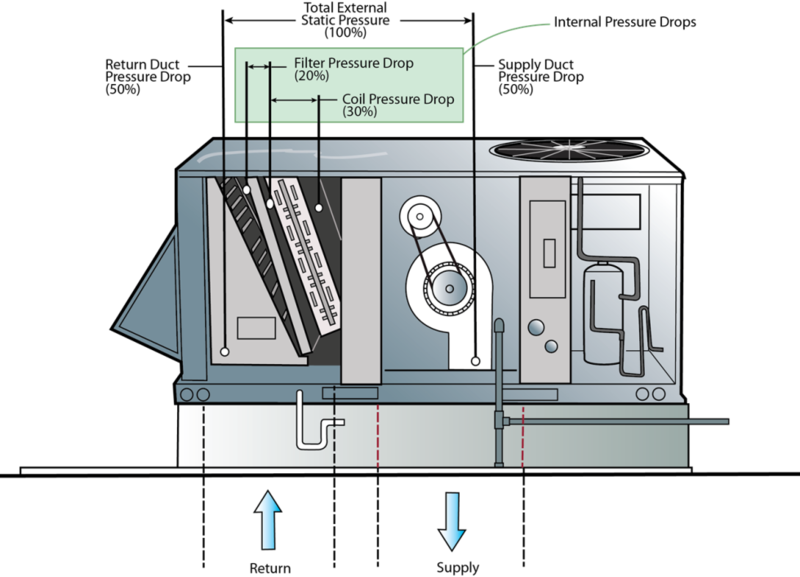 Static pressure measurement on commercial HVAC systems can vary significantly from one type of equipment to another. Commercial pressure testing also requires you to interpret and report internal equipment pressure drops. To remain savvy on the latest commercial air pressure testing, let’s take a look at this latest NCI commercial pressure testing update. Commercial rooftop equipment is typically used in commercial applications today in most regions of the country. Packaged equipment 7.5 tons and larger, offer some unique challenges that you should be aware of to avoid interpreting pressure readings inaccurately. Generally, when measuring total external static pressure, measure the pressure at the point where airflow enters the equipment and where the airflow exits the equipment. The pressure entering the equipment is a suction or negative pressure. The pressure exiting the equipment is a discharge or positive pressure. Add these two pressures together to find the equipment measured total external static pressure. Remember to drill test holes above the curb, since the curb is considered external to the equipment. Example: A 10- ton packaged unit in a rooftop application placed on a curb. Equipment entering pressure -.46” w.c.
Equipment exiting pressure +.51” w.c.
Total External Static Pressure .97” w.c.
You can also use the measured total external static pressure and the measured fan RPM to plot fan airflow on the manufacturer’s fan performance table or fan curve.Compare the measured static pressure to the equipment rated maximum total external static pressure to assure the system is operating at less than the maximum rated total external static pressure as rated by the manufacturer. Disregard the + and – signs as these represent the type of pressure measured and are not numerical values. Measured total external static pressure is used to plot fan airflow…but here’s where things begin to get tricky. Remember, the filter and coil pressure drops are not “visible” to the total external static pressure reading, so what if the filter and coil are dirty and have loaded up through normal equipment use by the time you balance the system? When equipment is started up the first time, equipment is new, and the filter and coil are clean. Ideally, the filter and coil pressure drops should be taken and recorded at the equipment. In the future, these baseline tests can be referred to whenever system pressures are measured. If the filter and coil pressure change over time, the increased pressure of these components should be added to the measured total external static pressure before plotting fan airflow. This is the most accurate way to interpret static pressure when plotting fan airflow for a packaged unit. “As shipped” is a term being circulated around the industry recently that brings clarity to static pressure measurement. When considering how to measure total external static pressure, and determining if a component of a system should be included or excluded in the total external static pressure reading, determine if the component was included with the equipment “as shipped”. What if No Pressures Were Taken at Start Up? If no filter and coil static pressure readings were taken at start-up, ideally you can find manufacturer’s data to determine what these components were rated at when the equipment was laboratory tested. The bad news is that many manufacturers do not publish this data. If no manufacturer data is available for filter and coil pressure drops, the next best thing is to use NCI pressures budgets as a default. Research has provided some typical pressure drops for filters and coils in well- operating commercial equipment. Filter Pressure Drop -To estimate clean filter pressure drop, multiply the rated fan static pressure by 20%. If the filter pressure drop exceeds 20% of the rated total external static pressure, add the filter pressure drop that exceeds 20% to the measured system total external static pressure before plotting fan airflow. Coil Pressure Drop -To estimate clean cooling coil pressure drop, multiply the rated fan static pressure by 30%. If the coil pressure drop exceeds 30% of the rated total external static pressure, also add the coil pressure drop that exceeds 30% to the measured system total external static pressure before plotting fan airflow. Using the example in the illustration above, let’s say this packaged unit is rated at 1.00” TESP. According to the NCI budgets, the filter pressure drop should not exceed .20” and the coil pressure drop should not exceed .30”. Say the filter pressure drop measured .35”, exceeding budget by .15”. The coil pressure drop measured .50”, exceeding the coil pressure drop budget by .20”. Add together the excess pressure drop of the filter and coil that exceeded the budget (.15” and .20” to find that the internal pressure drops exceeded budget by .35”. Add the .35” to the measured total external static pressure of .97”. (35” + .97” = 1.32”) Then plot fan airflow using the total external static pressure of 1.32” with the measured fan RPM to determine plotted fan CFM. Larger commercial air handlers may be rated with a total external static pressure rating similar to packaged equipment. But built-up or custom made units may also be rated based on fan static pressure. Equipment rated at a specified fan pressure is often done because a variety of components may be added to the air handlers for specific applications. For example, the basic air handler is built with a fan rated pressure of 3.0” w.c., the manufacturer will publish fan capacities under the tested conditions. Yet since these units are custom built, a number of accessories may be added to the equipment that would significantly change the total external static pressure of the equipment. So to keep effective engineering data, fan pressure only is used. Air handler accessories may include a DX or cold water coil, a hot water coil, pre-filters for the outside air or perhaps a series of standard and charcoal filters to capture pollutants or a series of HEPA filters for an operating room. Each of these, or a combination of any of these accessories, will greatly affect the rated total external static pressure of the unit. But if the equipment is rated at fan pressure, fan static pressure can always be measured and interpreted regardless of the number of accessories added to the equipment. 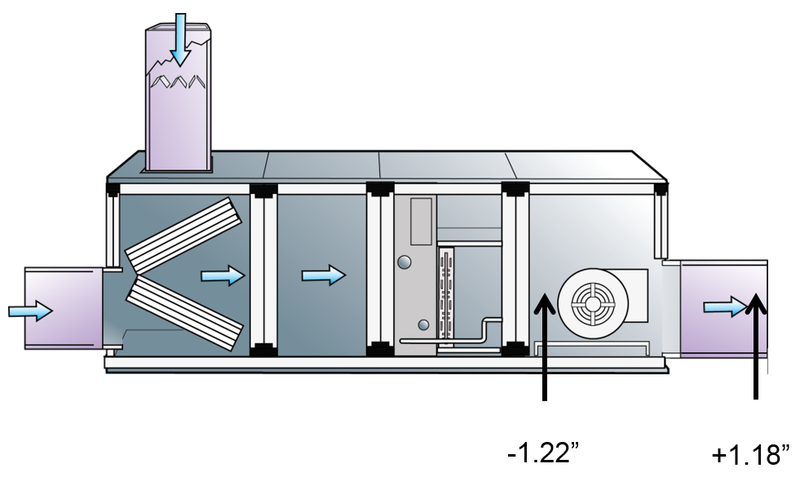 Example: A 20 ton air handler unit in a horizontal application is placed in a mechanical room. Fan entering pressure -.1.22” w.c. Fan exiting pressure +1.18” w.c. Fan operating pressure 2.40” w.c. The fan airflow would then be plotted on the manufacturer’s fan curve as published for the fan pressure. No total external static pressure would be published or referred to in the engineering data since only the fan pressure would be used. However, the internal filter and coil pressure drops discussed above should be used. As the balancing profession moves forward, we invite you to spend time on NCI’s website at nationalcomfortinstitute.com for a constant source of testing and reporting updates that will keep you abreast of advances in the balancing profession. Should you have comments about this article, please post them below.